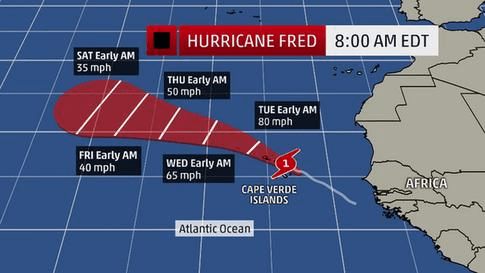 MIAMI – Tropical Storm Fred strengthened to a hurricane as it approaches the Cape Verde Islands in the Atlantic Ocean today. But it is starting so far north at 16.1 latitude that it is not projected to impact the Virgin Islands and Puerto Rico. The U.S. National Hurricane Center said Fred’s maximum sustained winds this morning are near 80 mph (130 kph). Gradual weakening is forecast to begin tomorrow. Hurricane Fred is centered about 40 miles (65 kilometers) west of Rabil in the Cape Verde Islands and is moving northwest near 12 mph (19 kph). The center of Fred is forecast to move over or near the northwestern Cape Verde Islands later in the day. 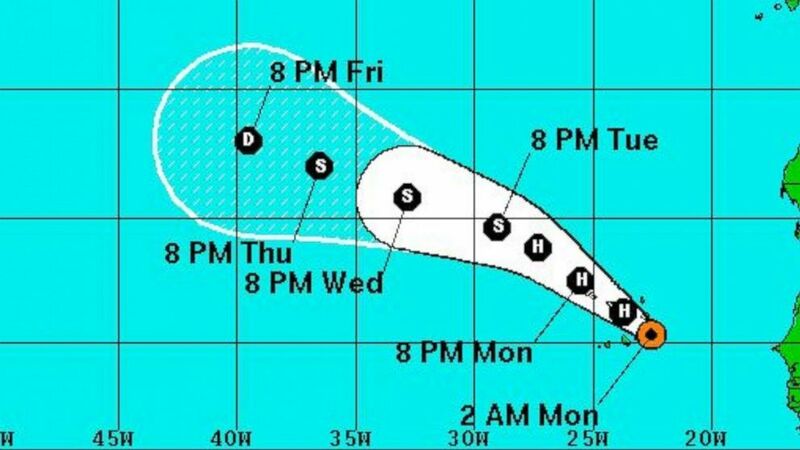 A hurricane warning is in effect for the islands.